Happy Halloween folks! It's officially the last day of October! Which means tomorrow is Wednesday, the first of November. Tomorrow I'm going to tell you all the amzing things that happen in November that you should check out, but today is bumpdate day! Cravings: I'm just going to go ahead and say Fruity Pebbles. I eat it at least once a day. I miss it when I run out of a milk. It's a problem. And still sweets. I also want nothing to do with wings. Every time Aaron suggests them for dinner, it sounds terrible. No clue why, I just don't want them. Weird stuff: Nothing specific. I think I'm just now in the random bouts of uncomfort part of the pregnancy. I've had hip joint pain, back pain. Other than that, I've felt pretty good! 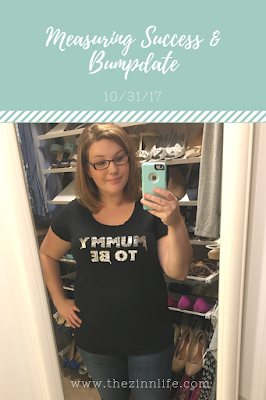 Fun stuff: We know we're having a little man! That's fun and exiting! And I am pretty sure I can feel him moving and kicking. Like little thumps on the inside. It's kinda weird at first, but then oddly reassuring. I feel him mostly in the morning, which means he's a morning person. Did not get that mess from me. And I feel him when I eat. We've also moved furniture around so the baby's room is empty and Aaron has started painting! I'm super excited for that project to take shape! Weight gained: I'm up 15 pounds total. Which is more than I wanted to be. I've been eating like total crap lately. I don't even know that I've seen an actual vegetable in weeks. Mostly, it's been pasta, quick dinners and fast food. I haven't meal planned in a long time either. Starting this week, I'm going back to eating like I used to: healthy! I made sure every meal this week had at least one vegetable in it when meal planning. I also planned healthy snacks. So at least I'm making some progress. Exercise: In my last post, I was doing 4-5 classes a week. If I'm honest, I'm probably at 3-4 classes a week now. There's a lot going on and I don't always feel great or have a ton of energy. I'm pretty proud I'm still at 3 classes a week. My gym has added warm yoga and pilates fusion to the class list. I've been doing both. I've really missed yoga and am so happy to have it back once a week! Endurance: It's about the same, but still slowly leaving me. I'm burning about 300-350 calories a class, even in boot camp and spin. It doesn't take much to completely wipe me out. We moved offices last week and even though I didn't do a lot of heavy moving, it still wiped me out. I came home and took an hour and a half nap that night and still went to bed at my normal time. I'm still listening to my body and take it easy when I need to. I can still run in class, but I'm dead last and that's about all the running I do. At this point, I'm still pretty proud of what I'm able to do and will just continue to listen to my body and do what makes sense. Classes/Exercises: The schedule has changed some, so I'm doing more spin classes than I was before. Like I said earlier, I'm happy to be adding warm yoga and pilates fusion into my class mix. I'm still trying to do boot camp/HIIT at least once a week, but we'll see how long that lasts. Overall, I honestly feel great. I don't have anything to complain about. I expect to continue to tire out easily and just plan to take things a day at a time. How'd your month go?! Fun update! It is so reassuring when you can start feeling him move inside you. You're over half way! So exciting!